The kid turned one last month. He was born in the Year of the Dragon, so I decided to make him a dragon birthday cake. I don’t know what came over me. I don’t usually make cakes that look like anything but, well, normal cake. But it was the kid’s birthday, so I wanted to do something special, even if he’s only one year old and has no idea. I was inspired by a friend who made the Hungry Caterpillar for her own son’s first birthday. She made it out of bundt cakes and cupcakes. I figured, how difficult could a dragon be? They’re basically snakes, with legs. So I decided to make basically the same cake, with modifications (different head, spikes, etc). I didn’t want to do too much work with shaping or cutting cake, so I figured I could make my decorative items out of chocolate or (K’s idea) mold them out of Rice Krispies treats. Since it was my first time decorating a cake, I called up my sister, who knows quite a bit about decorating baked goods, and asked for her advice. She told me about melting and cooling chocolate, and how I could either pipe melted chocolate into my desired shapes, or how I could cool chocolate into a sheet and then cut the shapes I wanted. I piped wiggly lines for whiskers, drew dark chocolate eyes onto a cooled white chocolate base, and cut chocolate spikes from a cooled sheet of dark chocolate. I made two cake recipes, a sturdy yellow cake and a moist chocolate cake. I also made one-and-a-half batches of Swiss buttercream (and would have made more, except I ran out of eggs). I poured half of each cake batter into the bundt cake mold, and I made the rest into cupcakes. I baked them and let them cool overnight, then assembled and frosted them on the morning of the party. I added food coloring gel to buttercream frosting and made quite a lot of green frosting, as well as yellow and red for accents. I made the dragon’s head out of three cupcakes and a bit of Rice Krispies treat, and used Rice Krispies for the limbs as well. While frosting, I discovered that 1.5 batches of buttercream went really fast. Next time I’ll make more; it’s better to have too much frosting than not enough. Hilariously, the worst part of the whole experience were the Rice Krispies treats. When I tried to make them, the melted marshmallow kept hardening rapidly, freezing into a solid ball instead of mixing with the treats. I tried to mash it together with sheer force but ended up with a thin, shattering mess of crushed Rice Krispies. I keep seeing commercials where kids are supposed to be able to make these. I don’t understand how it’s supposed to work. It’s store-bought for me from now on. Anyway, I eventually ended up sending K out to get emergency Rice Krispies treats and a couple of tubs of store-bought frosting (I ran out of frosting and didn’t want to serve naked cupcakes). Fortunately the dragon turned out pretty well. After all that fuss, the kid freaked out when presented with cake and refused to touch it. I think he was a little weirded out by all the people staring at him. Later, in private, he accepted a few bites. Hopefully he’ll enjoy cake more in the future. Scone recipes are essentially quickbreads, which means that they’re leavened with something other than yeast (baking powder / baking soda, usually). They’re convenience items, the benefit being that they come together easily and without too much fuss, and you don’t have to wait around to eat them. Today is the kid’s first Valentine’s Day at daycare, and I wanted to make something for his teachers. (His fellow classmates being one year old, I thought they wouldn’t care much about valentines. Turns out I may have committed a social faux pas; he got a valentine from one of his classmates this morning. I’m sure the kids won’t notice the lack of valentines from my son, but hopefully the other parents forgive me. It’s my first kid! I’m still learning daycare etiquette.) Anyway, because his daycare has a strict no-nuts-on-premises policy, I went with dark chocolate chips and dried cranberries in the scones. Baking the scones turned into a substitution frenzy. My go-to recipe for sweet scones used heavy cream, which I didn’t have in the fridge; however, I had plenty of milk, so I turned to my go-to recipe for savory scones instead, since it used buttermilk. (I didn’t have buttermilk either, but if you let a tablespoon of vinegar sit in a cup of milk for about ten minutes, you get a decent curdle.) I upped the sugar content and reduced the salt, and sprinkled the scones with demerara sugar before they went into the oven. The resulting scones baked up okay, but they still looked a little too hearty for Valentines Day, so I melted down some more chocolate chips and piped the chocolate into heart shapes on top of the scones for a festive touch. You know, it probably would have been less effort if I’d just filled out paper valentines. But this way made extra, so K and I also got something sweet to nibble on the way to work. I call it a win. 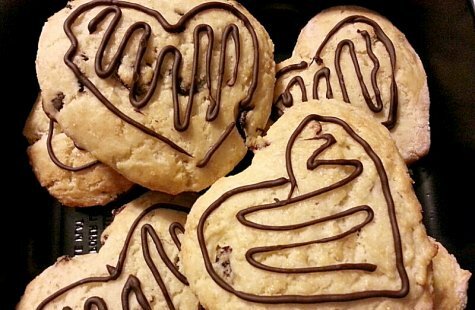 Note: these were fine as is, but I wouldn’t have minded if they were even sweeter (it is Valentine’s Day after all). Next time, I’d increase the sugar further, to 1/3 cup or even 1/2 cup, and perhaps add a teaspoon of vanilla when mixing in the buttermilk. Also, more chocolate chips never hurt anybody; I’d probably throw in another handful of those too. Combine the flour, sugar, baking powder, salt, and baking soda. Using a pastry cutter, cut in the butter until the mixture looks like damp sand. Mix in the dried cranberries and chocolate chips, and then stir in the buttermilk until just combined. On a floured surface (I like sprinkling flour on a Silpat), flatten the dough about 1 to 1 1/2 inches thick and cut desired shapes. You can gather scraps and cut them out again, but the first batch will be the most tender. Arrange scones on a prepared surface (another Silpat or a greased pan), brush with milk and sprinkle on some crystallized sugar, and then bake 15 to 20 minutes or until scones are golden-brown and tasty-looking. Cool on a rack. Meanwhile, melt chocolate chips in the microwave (cautiously — I go 10 to 30 seconds at a time, stirring after each interval). Pour the melted chocolate into a small plastic bag and snip a tiny hole in the corner. Pipe chocolate onto cooled scones, and stick them in the fridge until the chocolate hardens up. Or you could just eat them right away. I won’t judge. Technically the Chinese new year began on the 10th, which was this past Sunday. Festivities commonly last for days afterward though, so I still feel like I’m actually on time with this entry. When I was growing up, New Year celebrations were all about the food, much of which is highly symbolic — dumplings like purses full of money, oranges and tangerines are homonyms for gold, the word for fish sounds a lot like abundance, long noodles mean long life, etc. But you don’t really think of the symbolism when you’re eating — it’s just a celebratory meal, to start the new year off right. This year K and I invited our families over for hot pot. Hot pot is easy, all prep and no cook; you just put out plates of raw meats and cleaned veggies and a couple of electric skillets with simmering water, and everyone cooks their own food right there on the table. Just be sure to keep the “raw” cooking implements away from the “safe” eating implements to avoid cross-contamination, and you’re good to go. Everyone can cook food to their desired doneness. For instance, my mom likes to wave sliced beef gently in the water until the red just fades to pink, whereas K’s mom leaves beef in the water until it’s very well done. When I was growing up, my siblings and I would hoard food with fanatic possessiveness; any onlookers would have heard plenty of “that’s my shrimp ball! I put mine over here! Get your own!” etc. Now that we’re adults, it’s a lot more relaxed. For hot pot this year, we did our shopping at the huge new Lotte in Catonsville and it was fantastic. The thin-sliced meats are perfect for hot pot; we got pork, lamb, beef (ribeye) and duck, all thinly sliced and ready to go. We bought squid, which K cut crosswise so that the pieces would curl up when cooked. We also got frozen fish balls and beef balls (we were delighted to find Lotte’s bulk frozen meatball display in the freezer section, $5/lb!). My mother brought peeled shrimp and “white rice fish” (whitebait), both of which cook up in a flash when they hit the hot water. For vegetables, we got Napa cabbage and watercress, and K’s mom brought snow peas; we also bought canned straw mushrooms and quail eggs, also from Lotte. We put out bottled condiments so that people could make their own dipping sauces (soy sauce, hoisin, oyster and XO sauce, sriracha). It was definitely an impressive spread. We had cooked food, too. K’s aunt brought homemade turnip cake, which I intend to learn to make; it’s fantastic sliced thin and fried crispy. And K and his mom made dumplings and steamed shumai that morning. It was so delicious; I feel full just thinking about it. Anyway, when everyone is finished cooking, the cooking water will have taken on all the tastes of the meat and the vegetables. That’s when you put in the noodles to cook (transparent saifun, also from Lotte), and let everyone finish off the meal with a bowl of hot noodle soup. It’s a warm and filling end to a great meal. After all, nothing beats eating a big dinner with family. Today is officially World Nutella Day, a day I’ve happily celebrated every year since its inception in 2007. 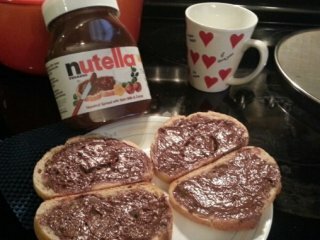 Nutella is a chocolate hazelnut spread, sweet and luscious and wonderful. When I was a kid, Nutella was a huge treat for me; I’d eat it spread on toast or as a single layer in a sandwich. With its chocolatey taste, it really was like eating candy for breakfast. It used to be hard to find, but now you can pick up a jar at any grocery store (or, if you’re an addict like me, you can pick up a two-pack of huge jars from Costco). 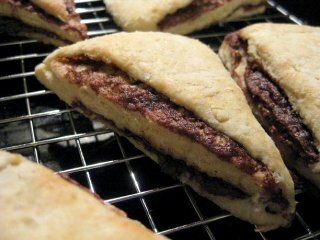 It’s just a basic scone recipe with layers of Nutella folded in. Careful eating these right out of the oven; the Nutella layer is like napalm. Eating Nutella toast for breakfast made me feel a little like a kid again. Maybe that’s why people like celebrating World Nutella Day. Anyway, I’m looking forward to a tasty cup of Nutella hot chocolate tonight.